The push for BYOD (bring your own device) policies in workplaces has been on the rise for the last couple of years, but many corporations have frowned upon Android devices due to "security issues" within the OS. Samsung is looking to change that mindset with its newly-announced KNOX solution. Essentially, KNOX is a security-enhanced version of Android – based on the NSA-approved SE Linux – optimized for Samsung's SAFE (Samsung for Enterprise) program. It's built-in to both the hardware and Android's framework, so it's really a full-coverage solution. At the application layer, it works to separate personal and corporate data by containerizing and encrypting corporate applications and data, which protects against viruses and malware, as well as outside attacks. On the surface, KNOX acts like an application and can be launched directly from the apptray or homescreen – which basically opens a containerized OS within Android where all the corporate applications and files are stored. It's also compatible with most common enterprise infrastructures such as MDM and VPN. KNOX is slated to be available on "select GALAXY" devices beginning in Q2 of this year. 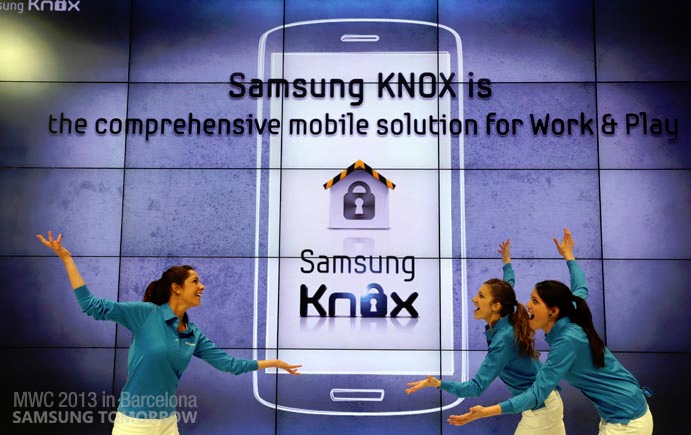 Barcelona, February 25, 2013 - Samsung Electronics Co, Ltd., a global leader in digital media and digital convergence technologies, today announced Samsung KNOX, an end-to-end secure solution that provides security hardening from the hardware through to the application layer. KNOX incorporates Security Enhanced (SE) Android developed by NSA (National Security Agency),and integrity management services implemented in both hardware and the Android framework. At the application layer, KNOX offers a container solution that separates business and personal use of a mobile device. This separation is enforced by SE Android and file system level encryption, offering protection of business data and applications from data leakage, viruses and malware attacks. Lightweight and compatible with existing common enterprise infrastructure such as MDM, VPN and directory services, KNOX provides reassurance and convenience for IT departments looking to implement and manage Bring Your Own Device (BYOD) strategies. Easily accessible via an icon on the home screen, the KNOX container presents to users a variety of enterprise applications in a secure environment including email, browser, contacts, calendars, file sharing, collaboration, CRM and business intelligence applications. KNOX enables existing Android eco-system applications to automatically gain enterprise integration and validated, robust security with zero change to the application source code. KNOX relieves application developers from the burden of developing individual enterprise features such as FIPS compliant VPN, on-device encryption, Enterprise Single Sign On (SSO), Active Directory support and Smart Card based multi-factor authentication. KNOX is a Samsung enterprise solution and aligned with the Samsung For Enterprise (SAFE) programme, an ongoing effort initiated by the company to promote the readiness of its devices for enterprise use. More information on the SAFE program is available here.